This studio portrait is a mystery to me. Like the wedding portrait in the previous post, it came from Texas with no information. The words DEMACHI. SAITO. SEI. are printed below the photograph on the cardboard mount. If anyone knows what they mean, please comment below! Two of the men are wearing hats with red crosses on them, and one of them also has a red cross on his sleeve. Were they in a medical profession? The man in front is wearing a Western-style suit and uniform hat, reminiscent of a bus driver or train conductor. Were these men friends? Is there another reason they might have posed together for a formal portrait? Interesting image. My first thought was it might be related to WW2, but I’m not a war expert so it remains pure intuition. Have searched for “Saito”, according to the source “japantoday.com”, it’s one of the ten most common surnames in Japan. Thank you, Isabelle! I’m really ignorant about Japanese clothing, but I know the military adopted Western-style uniforms in the late 1800s, so I don’t think these men are in the military. If I were to guess the date of the photo, I’d put it around 1900, but that’s just a guess. Thanks so much for your comment! It’s interesting to study old photos, there’re so many stories behind the images which we might never know. Good ones or sad ones. It reminds me of one of the subjects in my master programme in English language “English Medieval Manuscript Studies”. The students are required to analyse the scripts/texts from medieval times. It’s a tough subject. You have a great site, thanks for sharing! Thank you for your kind words! It’s interesting that you’d make a connection between understanding historical photographs and analyzing medieval texts. Photographs usually give us clues, but we still need context to understand them, just as we do with early texts. Also, we tend to think of photography as a modern medium, but portraits from the 1840s-1870s often contained people who were born in the 1700s. So, in a way, the images connect us to that earlier time. What an intriguing photograph. They seem unrelated to each other, but there must be a connection. Colleagues? Yes, possibly. At first I thought they might be representing different branches of an organization, but what kind of organization? Without more specific insight into the clothing, I don’t think we can know if that theory makes sense. Thanks, Tracey. I don’t know enough about Japanese clothing to know what these men might be. I was intrigued, though, that the chap in front is wearing a Western-style suit but like the others sticks to traditional Japanese footwear. What a mysterious image! I love all the responses–and of course, being a medievalist, Isabelle’s comment connecting photos to manuscripts. I also have the feeling that the men are related in some way by their occupations. Maybe a good puzzle-solver can figure out how a bus conductor [? ], two emergency responders [?]. and a shogun [???!!!] are connected. I wonder if they are all wearing socks because they are indoors and Japanese people traditionally remove their shoes upon entering a house. I’m glad you saw Isabelle’s comment about medieval manuscripts! My son speaks Japanese and lives in Japan. However he knows nothing about vintage photography. That said, I asked him what he thought of the photo. Here’s his reply: I did some quick googling in Japanese but nothing came up. The unfortunate thing about the “demachi saito sei” part being in Roman letters is that it makes it difficult to pin down the Japanese kanji. I would guess “Demachi” is the name of a part of town and “saito sei” looks like a name. Very interesting, Shayne! Thanks so much for contacting your son about this. It was very kind of him to look into it. I’ll continue to run searches occasionally for “Demachi Saito Sei,” in case another photo from the studio is ever shared online. People post vintage photos to sites like Flickr all the time. Museums are also digitizing their collections, slowly but surely. So I wonder if it was sent to men fighting in the war so that they remember their relatives or the other way around. ‘I will be waiting for you’ (if the translation is literal, which it possibly isn’t.) to give them hope that someone will be there for them when they return. And I wonder if it might have been taken during or after the Russo-Japanese war. Did you notice, also, that there is a pair of linked letters after the first word? Looks like S and Y. So it should be possible to track down some related photos, perhaps? Oops, posted my response in the wrong place (please see below). If your interpretation of the meaning of “Demachi saito sei” is correct, the photo could also have been taken at the time of the First Sino-Japanese War (1894-95). 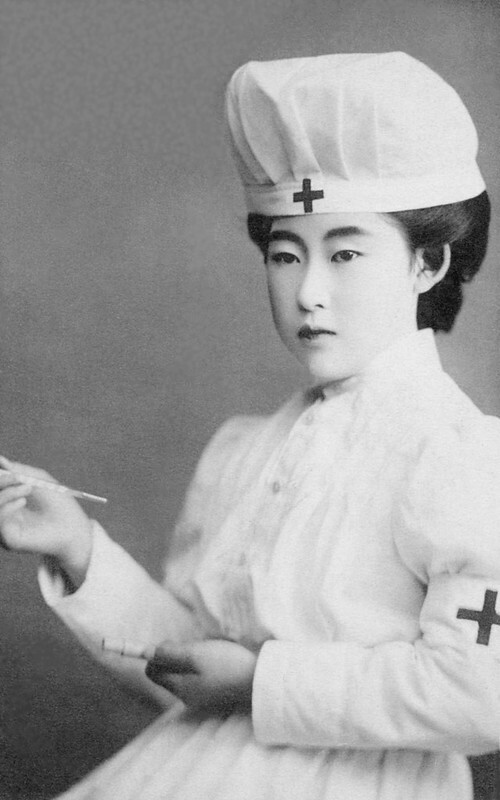 The Japanese Red Cross Society was founded in 1877. Thanks. 🙂 I also had a thought that it might have been taken in the USA if they’d come over to help with the San Francisco earthquake. It could explain the English translated words and possibly the man with the post-office or stationmaster type clothing (ie, westernised). I’ve only ever posted photos in comments by mistake (including the one in my last comment! ), so am not entirely sure how… I suspect just by pasting in the link to the .jpg file. I’d actually meant to give you a text link to the flickr page! There’s probably something about it in the wordpress dot com forums or the support pages. If I come across it I’ll let you know. By the way, my ‘net connection keeps dropping out so if you get this comment twice, sorry! I also looked it up. I got “Seiko in the town site.” Looking for Seiko, I found “success,” ergo “Success in the town site,” which would make sense in relation to the Red Cross. As for the man in front, maintaining the Red Cross association, I’m thinking he may be an ambulance driver. I’m doubting this was in the States despite the English lettering. I have Japanese chinaware from Japan, from the time period and the maker’s mark on the back used English lettering. I was told it was common for the period. Sort of a fad. It may have been meant as a card to send to family or former community members then living in the States. Finding someone familiar with the time period (late 19th/early 20th century) perhaps a professor could be useful. Thank you! I was at a loss when trying to research this photo, so it’s been really helpful to have visitors wrestle with it and share their insights. Your idea that the man in front might have been an ambulance driver is very interesting. When I wrote “bus driver,” I wasn’t considering the fact that engine-powered buses as we know them probably didn’t exist when the photo was taken. There were, of course, horse-drawn passenger wagons and ambulances, and the men driving them would likely have worn a uniform of some sort. Trains were used as ambulances in Europe during the First World War, but I don’t know if they were ever used for that purpose in Japan. I do think the photo was printed in Japan, but it’s always good to consider other possibilities. I knew someone, now dead of course, who drove an ambulance for the Red Cross in WWI. Her uniform was a female version very similar to his. And I wonder how the photo got to Texas. It was interesting to read the speculations. Demachi could be an Italian surname as many foreigners practiced photography in Japan in the late 1800s to early 1900s.. Having said that Demachi, Saito and Sei are not names that appear in a comprehensive look at photographers of Japan from 1853 to 1912 in a book by Terry Bennett, which I’m lucky enough to own. From looking at numerous examples in that book it was not uncommon for photographers to use English script alone, as well as a mix of Japanese and English on their photos, so this wouldn’t be unusual. Also translating words using Japanese translation apps is fraught with problems as it would be if someone from Japan translated words from English in similar circumstances. If these are names and places (which they most probably are) then it is like trying to translate the surnames Potter or Green etc. I think whoever suggested this is an ambulance crew has got it spot on! There are two medics, the driver, who would’ve also been a stretcher bearer along with the other man without the Red Cross symbol. Another great find! Oops, put my response in the wrong place again, dang it (see below). Thank you! It’s so good to get your input. I think you’re right, these men were a team, which explains why they were photographed together. Margo’s idea of an ambulance makes perfect sense, and as you say, an ambulance would need a crew of several people. It’s great to have you back in action!